Raven surprised us by going into heat almost 2 months earlier than planned! 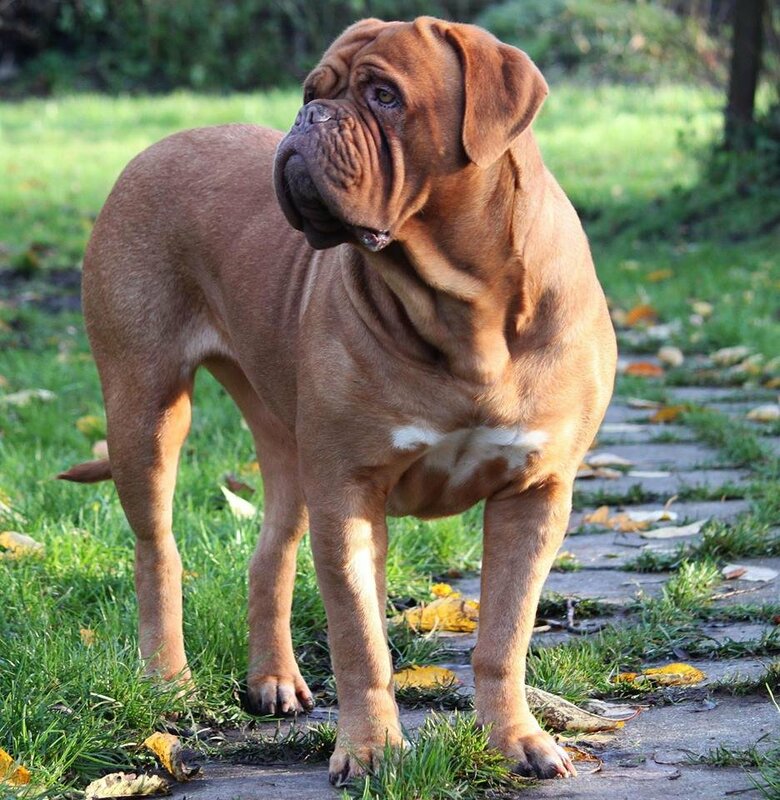 So very soon we are off to Holland to breed her to this fabulous up and coming male! We are very very pleased with how Raven has developed, so it will be exciting to see what she can produce. Raven will have her won page soon. 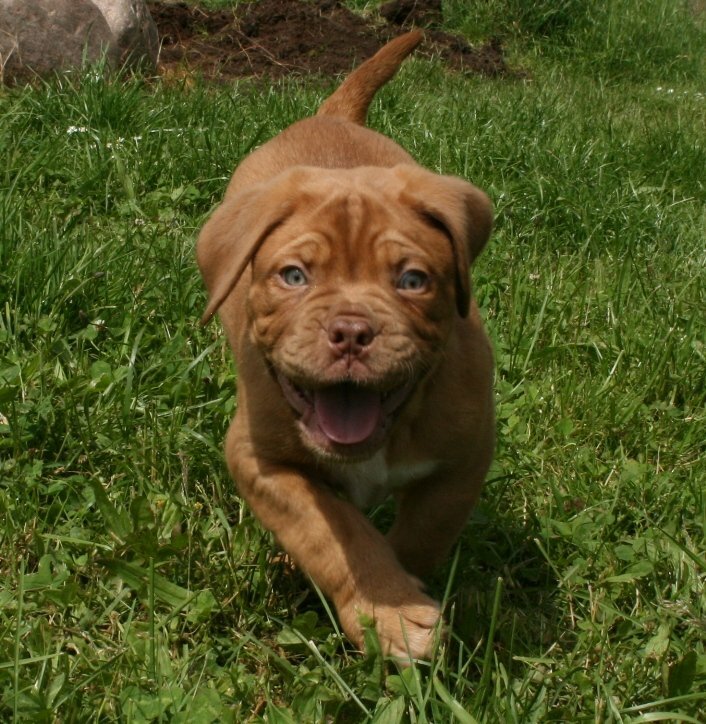 Until then look under "planned litters" to see more about this breeding. We are not great at updating anymore.... Life is busy with all sorts of things, so the time in front of the computer is limited to say the least. We have a beautiful litter born on the 15th of December - 4 girls and 3 boys. All are doing great so far :-) As we loved our last litter so much we decided to repeat the breeding and use Nectar again. 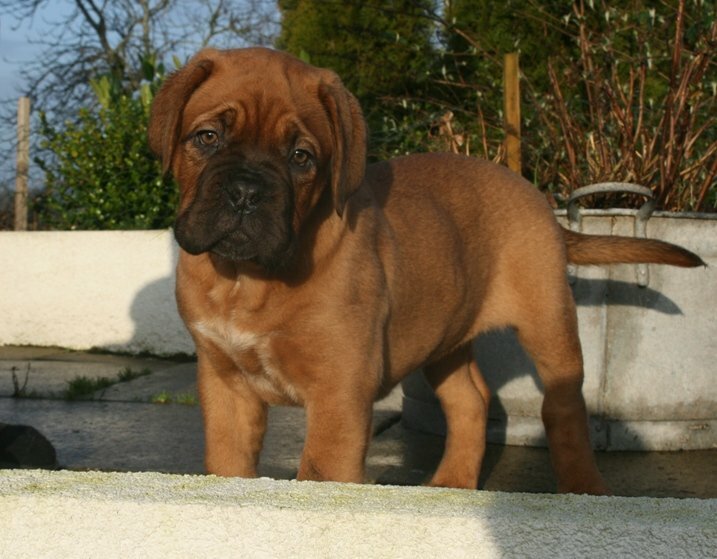 The last litter was very consistent in type, healthy and had wonderful tempers so we decided to use him again. Our beautiful girl, Raven, was just tested and qualified for breeding. Her hip and elbow results came out perfect; HD:A and ED: 0, so we are very happy. 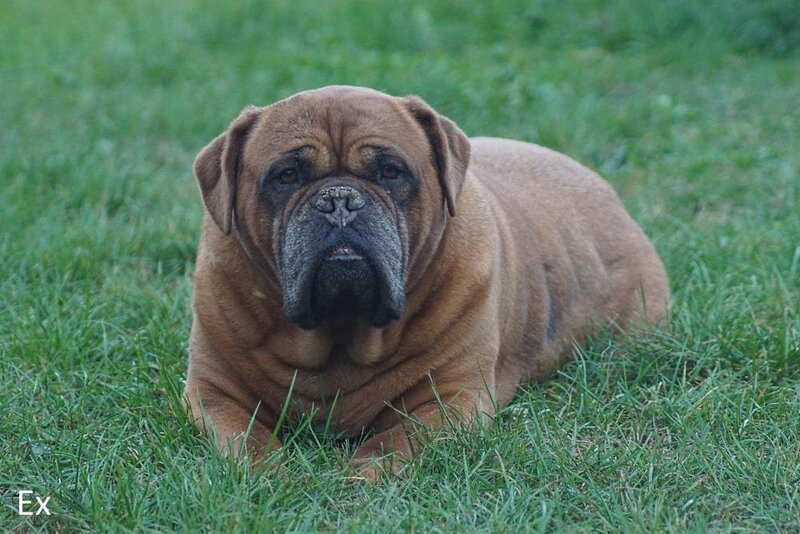 She was just in heat and we bred her to a beautiful male, so all fingers are crossed for a beautiful litter. Planned litters see it here. On May 14th the puppies arrived. Although the birth went well - 12 puppies delivered in barely 5 hours - we experienced something we have never before :-( 5 puppies were still born, another two came out lifeless but we could revive them. 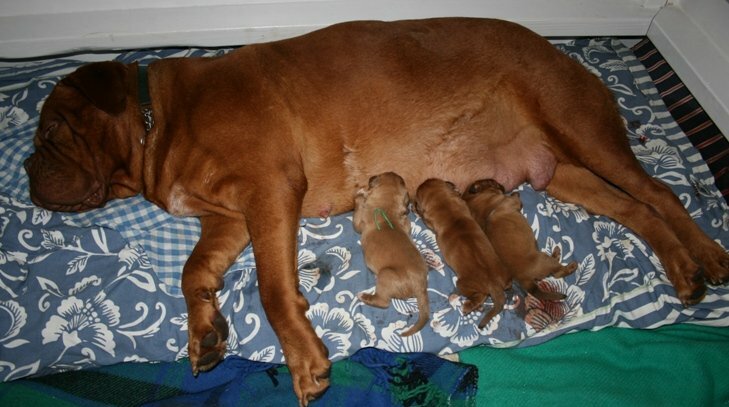 One puppy had clearly been gone for a while and seemed underdeveloped, but the others were fine and seemed to have passed during the birth for some reason. We lost another pup when they were a week old, so basically we are left with 6 puppies. Luckily they are doing well, but as you can imagine this was a bittersweet experience - hence the lack of updates. I will update again soon with pictures and more information. It has been a whilewithout much to tell. I have been really busy setting up a business with a private practice, so my time the past year has pretty much been spent working on that. I normally take a lot of pictures and download themon a regular basis,and I have been behind on that too. 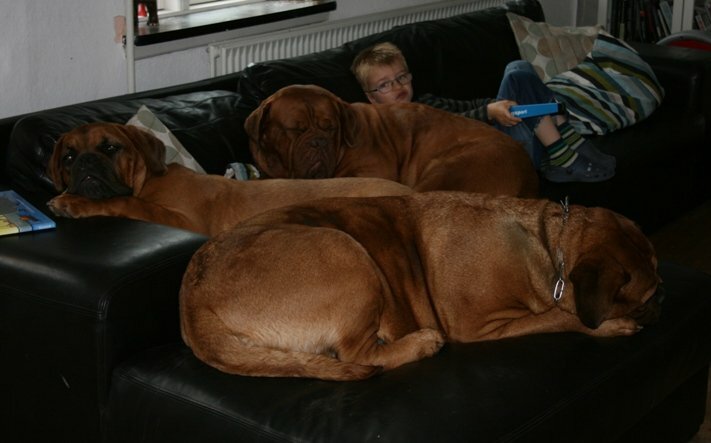 However I just did it tonight and realized that ALLof the dogue pictures are of us lazing in the couch with them :-) Haha...maybe it is time to get back in the show ring? We plan on breeding Nyx one last time shortly. More about that when we have some information. Raven, our baby, is growing up. I think she has turned out very nice - she's very athletic, well built and has a wonderful caracter. In April she will be old enough to have her official HD/ED scores done. 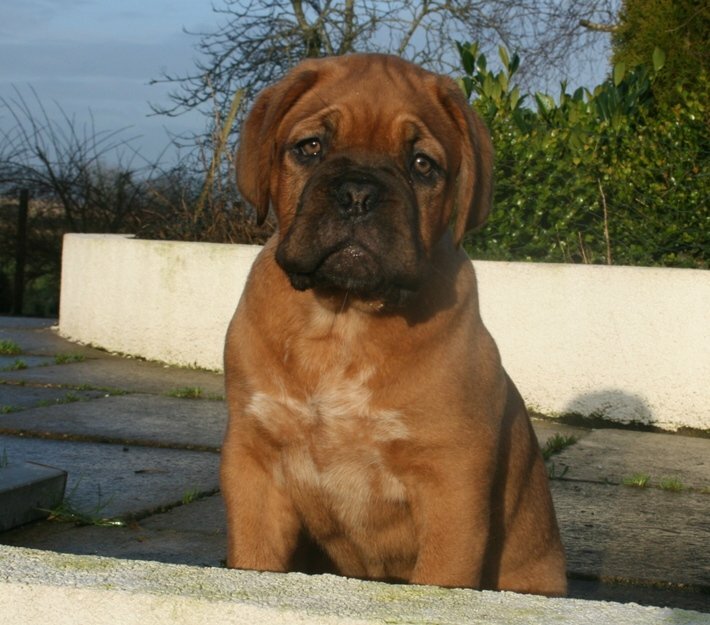 As she is the daughter of Mambo, I really hope she can be part of our breeding programme, but time will tell. I did a small album of uor latest pictures. See it here. 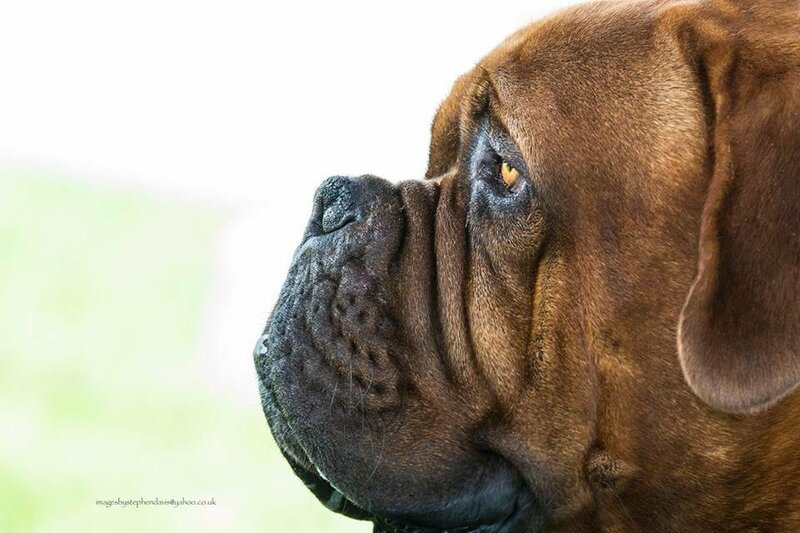 Unfortunately we got some sad news this time around... We lost our wonderful boy Mambo last month. He has been healthy and active his entire life and practically never had a day of sickness, but in early September we suddenly had a sudden bout of cramps that went on for a minute or so... He seemed fine afterwards and we thought it was a reaction to a change of cleaning devices.He was okay for a while and then it started again. It turned out to be a braintumor and it suddenly went downhill very fast. Within hours he became paralyzed (back part) and we had no choice. Needless to say it was a big loss for us and we were all very heartbroken. There are so many fantastic memories to look back at with Mambo - all the wins, his puppies but most of all just the life we had with him. 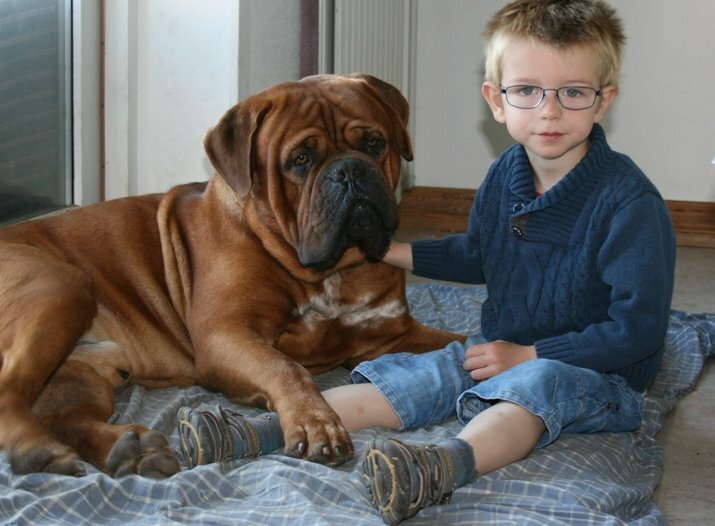 6½ year was just not long enough... His dad was 9½ years old when he hied and we had hoped that Mambo would reach that age too. The best family dog you could ask for. We bred Nyx 5 weeks ago to Mambo - just before he got sick. We are waiting to see if there are puppies on the way; stay tuned! Firstly; Ranger has moved out to a new home. 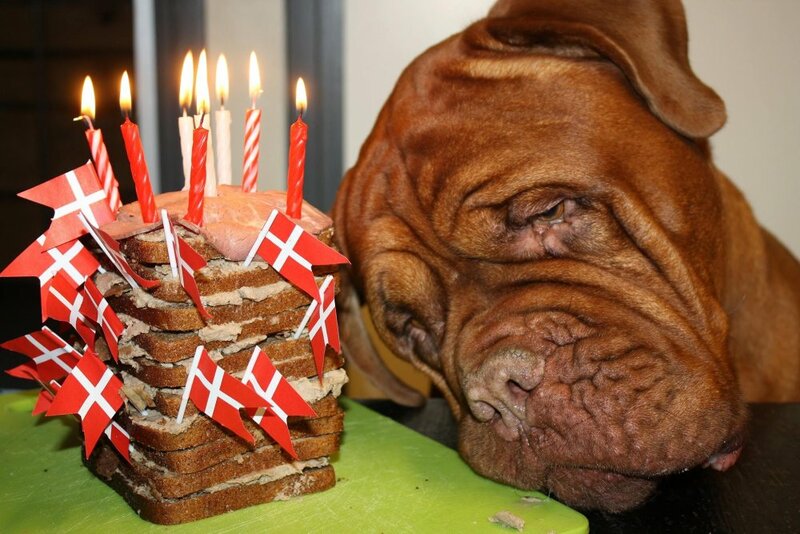 After he turned 2 and matured Mambo became less and less excited about him and the tensity between them grew. We decided that it was for the best that he moved, and in April he moved out to his sister, Rhea aka Mollie. We miss him, but he has settled in really well, and Mambo enjoys being king of the castle again. Nyx was bred in her last heat and went empty... She will be bred to Mambo in her next heat very soon. We really liked how their last litter turned out, so we are repeating it hoping for a few more pups than last time (3 boys). We have been really busy this year with renovating house and 3 kids. 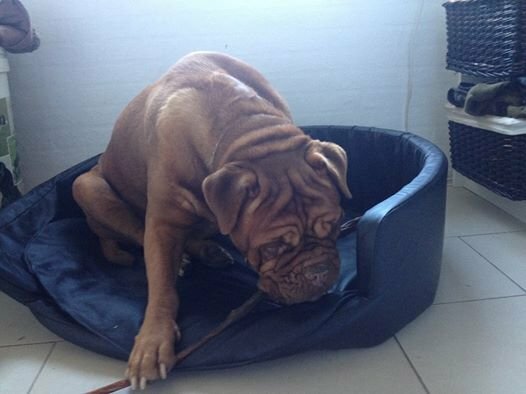 Raven, our youngest dogue, is 10 months old now and looks great. We plan on showing her next year. This year we just haven't had the time. Will make her a page soon. All pups have now left except for Black Velvet who will leave for Czech Republic in a while. Raven stays with us :-) Isn't she a beauty? She's a mix between our two original bloodlines. Will be exciting to see how she turns out when she is fully grown. It's been snowing like crazy and is really-uh cold, so we are spending all our time inside these days. 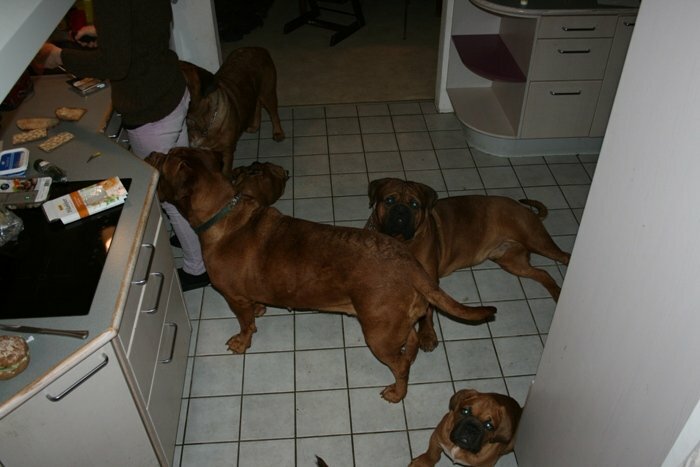 Steady "helpers" in the kitchen while packing the kids' lunch. See A L L the last puppy pictures here. The puppies are 5 weeks old today. They are an active, loud and totally cute gang :-) Most of them are sold, but we still have 2 beautiful black masked girls available. See their new pictures in the gallery here. Nyx loves to babysit and even tries to nurse the puppies. 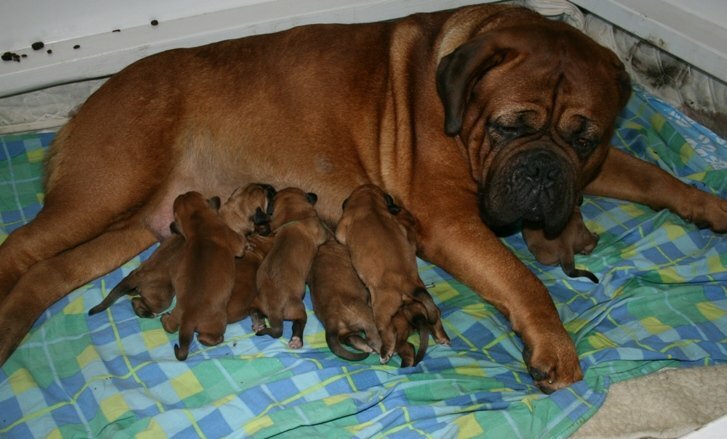 I have never seen a female (who is not their mother) try to feed puppies before :-), but she lets them "eat" and loves to stay with them. 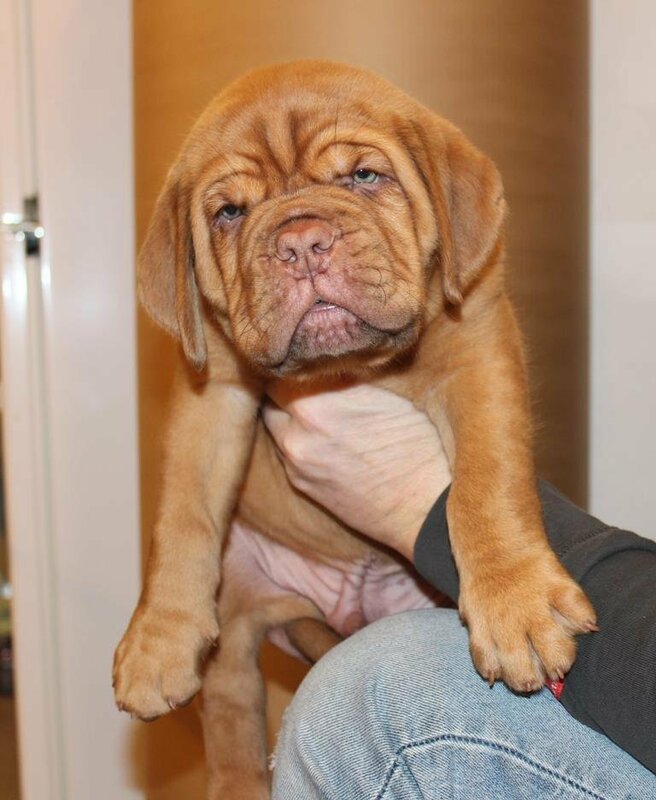 We have a new dogue in our kennel! 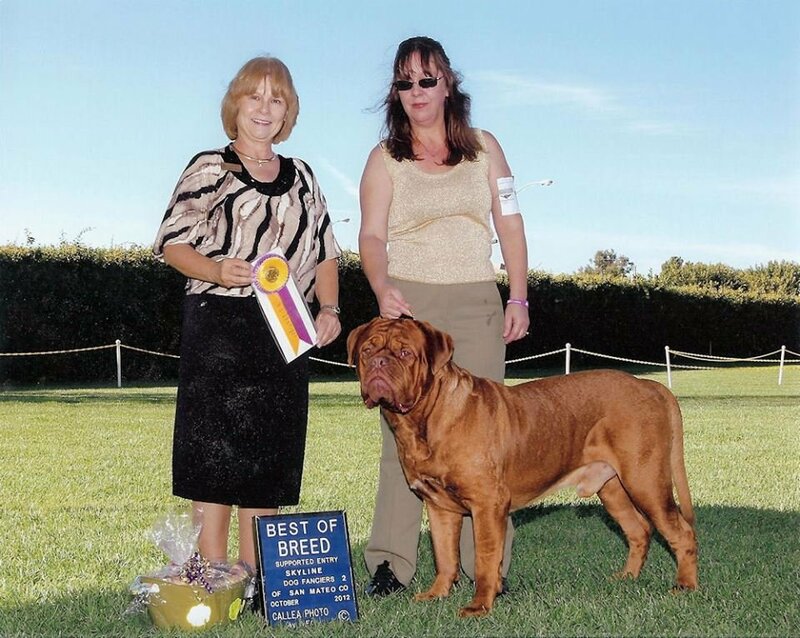 Or rightly said; we have taken a dogue in partnership with our friend Marianne, Kennel Centio. 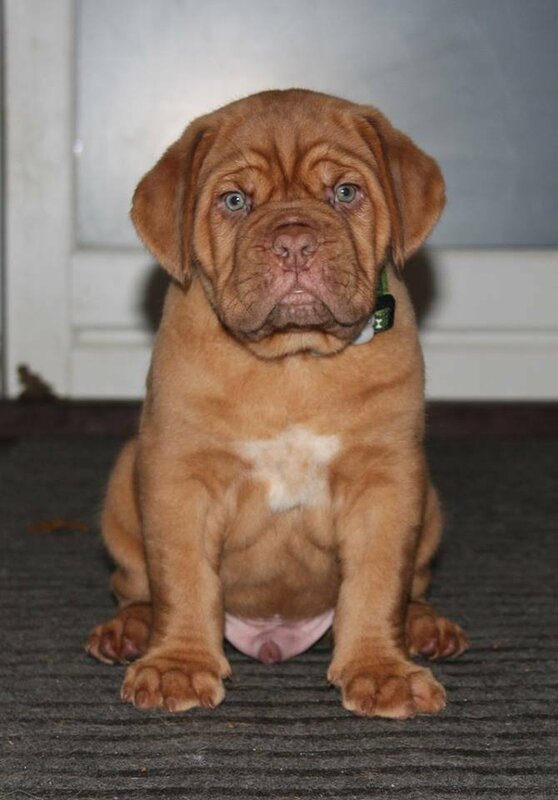 It means we co own Her homebred dogue, Centio Genesis. Genesis was recently scored with excellent results (HD: A - ED: 0). She will have her own page here on our site shortly. Sometimes things happens fast... Amazonite Riverside was rehomed in just one day. 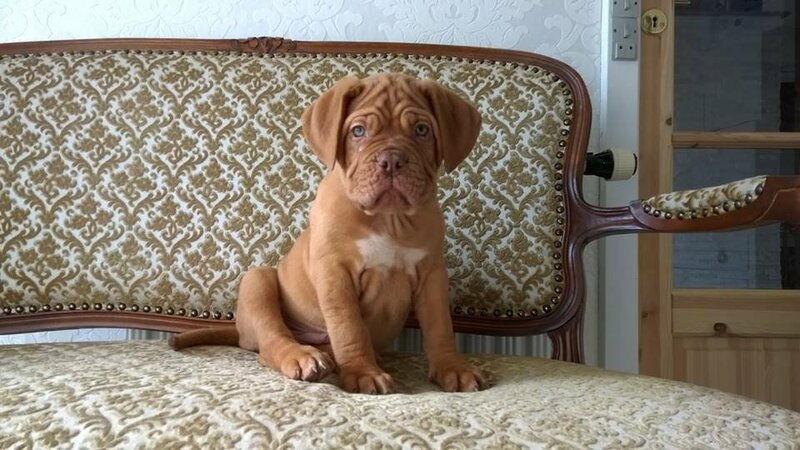 A previous puppy buyer of ours needed an extra dogue as their older female was feeling lonely after loosing their other dogue. So today he's moving. 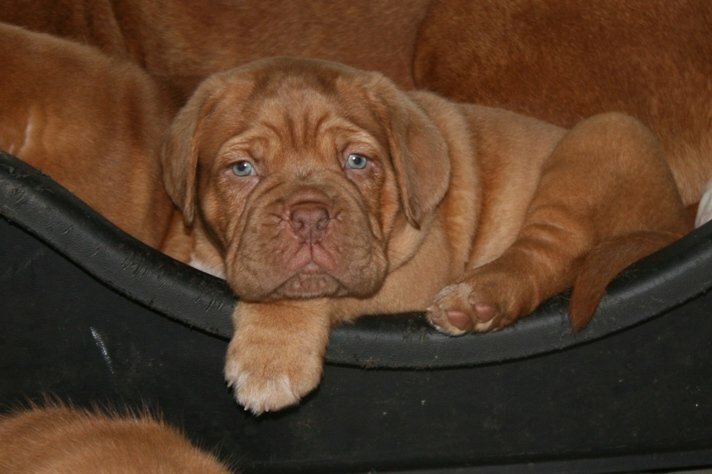 The puppies are now 3½ weeks old. They are moving around and making a lot of noice. The are playimg and a few of them now know how to crawl out of the puppy-box. See pictures of them here. See the new pictures here. It is always a relief to get past the first days with a litter. Now it happens fast and I can't wait to watch the get on their feet and run around. Wonderful news!! Rio's puppies are here!!! 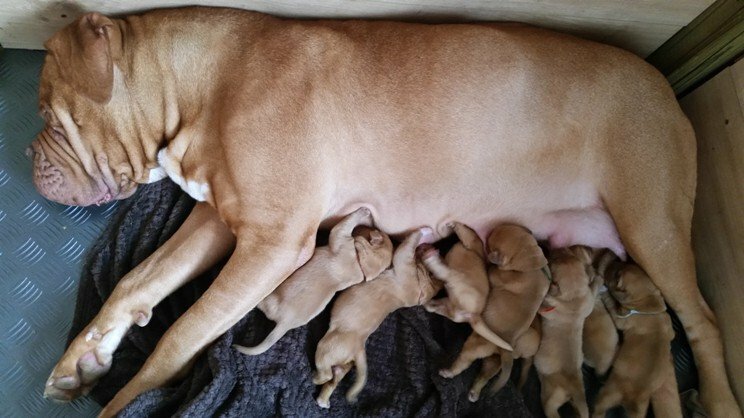 It came as a surprise as I didn't think it would be any earlier than Tuesday, but suddenly she started panting and a few hours later the water broke and 7 beautiful puppies were born in 4½ hours. Then 3 hours later number 8 arrived - a bit tired and weak, but alive! 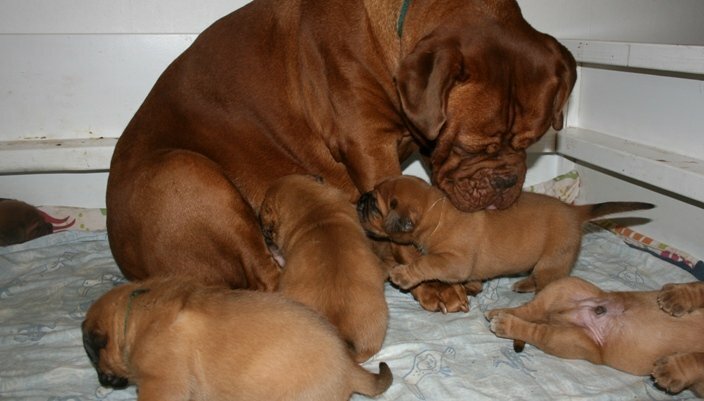 After quite a few litters with mainly male puppies this litter is a big turn-around! 2 black masked males and 5 black masked females and 1 red masked female. So far they look really good. 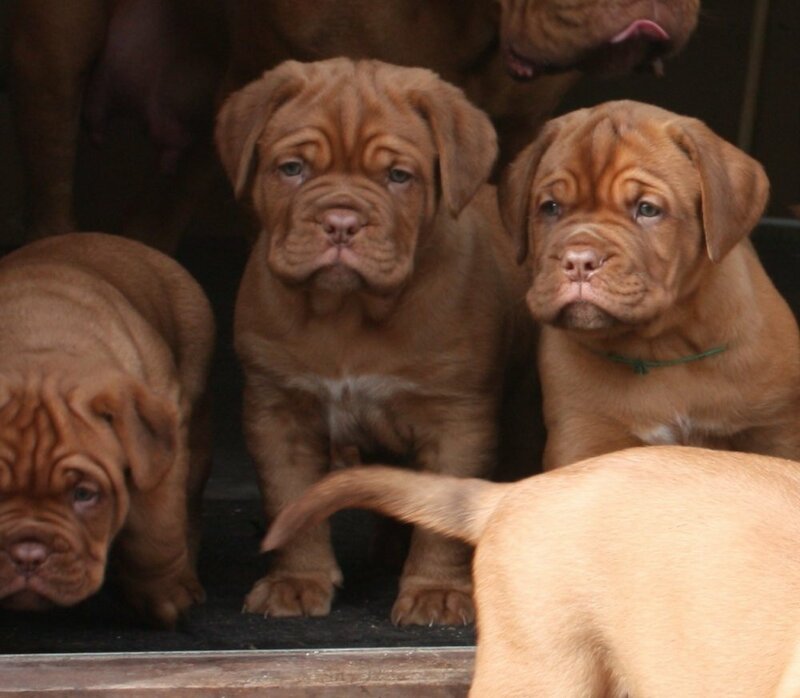 They are all very dark red with broad, wide muzzles. Will be very exciting to see them grow. 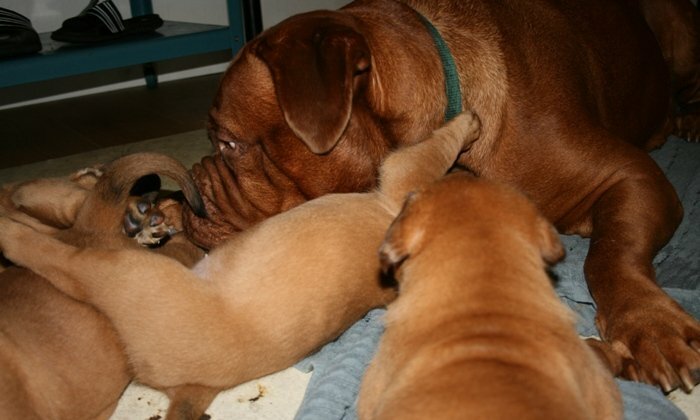 Rio is a fantastic mother and seems to know exactly what to do. See more in their gallery here. We have been up to our ears in house renovating, but in 2 weeks we are done and life can get back to normal! That means getting out to a few more shows and Ranger who just turned 18 months will be scored shortly. I think he is a nice looking youngster, so it will be exciting to see if he makes the cut or not. I have learned to expect nothing and just be pleasantly surprised... 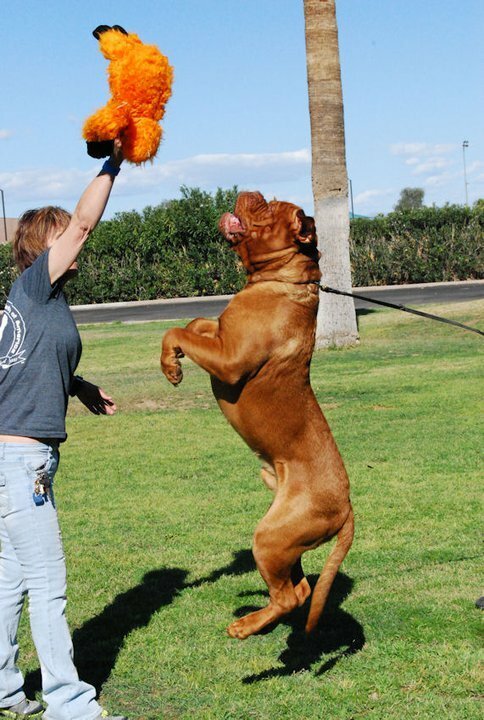 He is very athletic, but that is no garantee. We will see what the x-rays say. We came back - almost 2 weeks ago - after a fantastic weekend in France. I went to promote our young male, Ranger, as I haven't shown him at all since he was a baby. 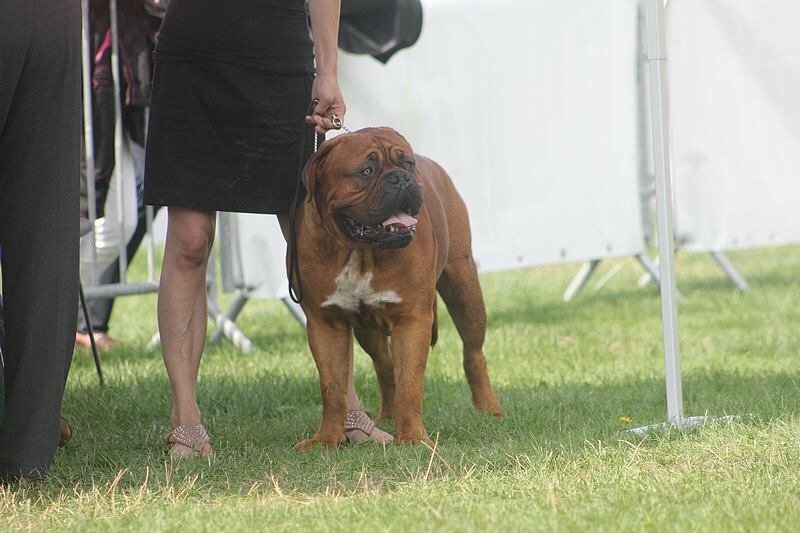 Although Mambo actually retired last year when he became International Champion and he's nearly 6 years old I still think he looks pretty good and I decided to bring him along to keep Ranger company - and enter him in the champion class. Ranger got an excellent and a very good critique but wasn't place. 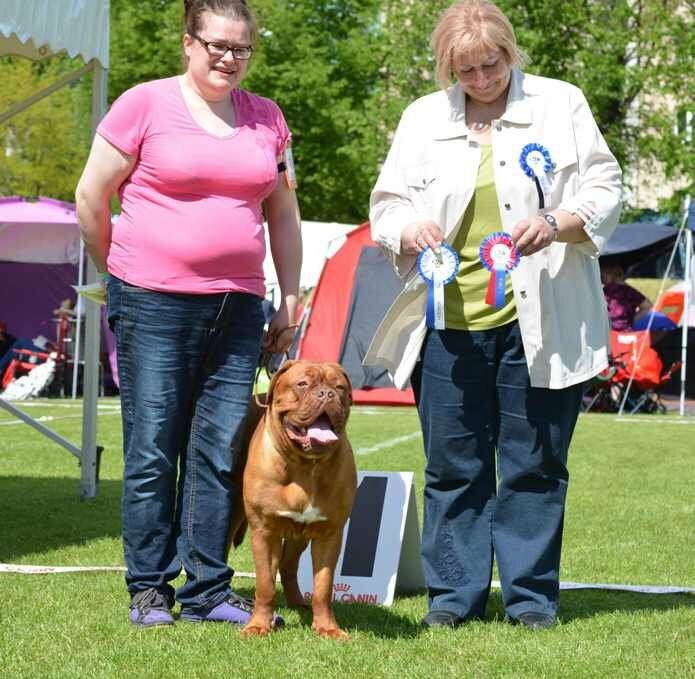 Mambo however won the champion class! I have been 3 times to the French Clubmatch with Mambo and he's been placed every time. 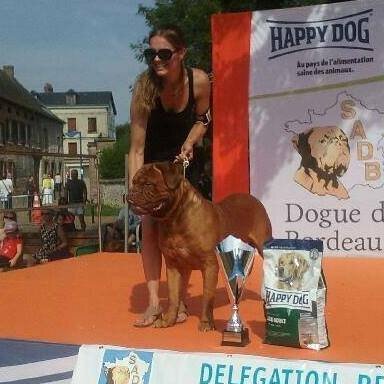 It is always very special to be placed with a puppy, because it is the beginning pf a show carreer, but it is even more special to be able to back with a fully grown dogue and win again. 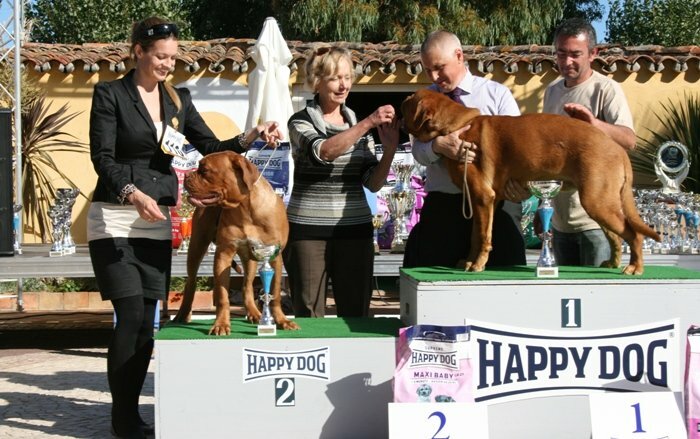 Which is exactly what Mambo did; he won the Ingtermediate class when he was 18 months old and now the Champion Class at 5½ years old. 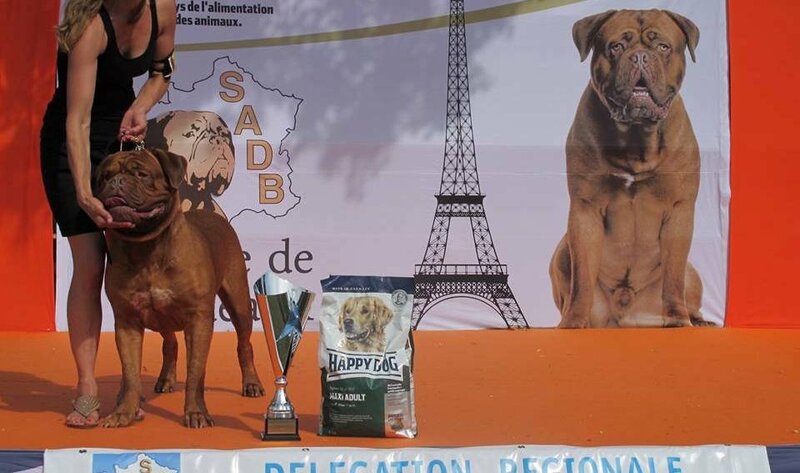 I'm very proud of him and of having bred him here in our kennel. 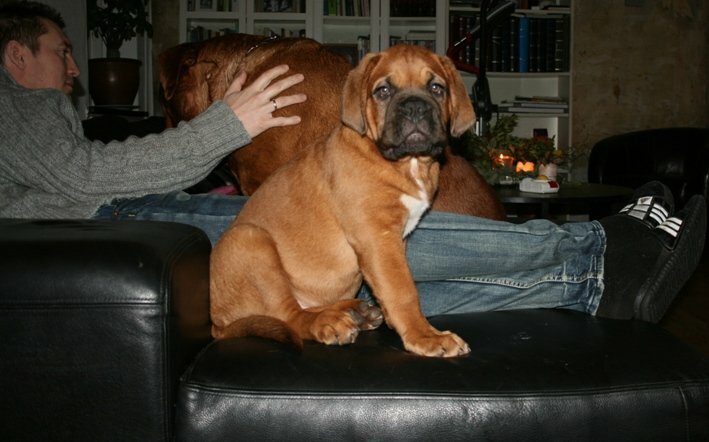 WHen we started out with this breed you literally could not buy a show-potential Dogue de Bordeaux in Denmark. 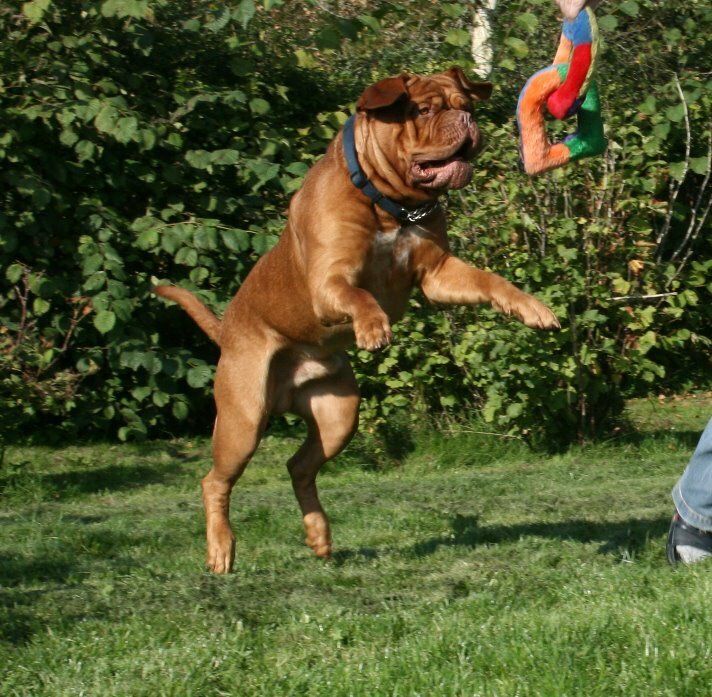 It was a goal for us to be able to produce dogues where the best could compete internationally. It seems that with Mambo we achieved that. 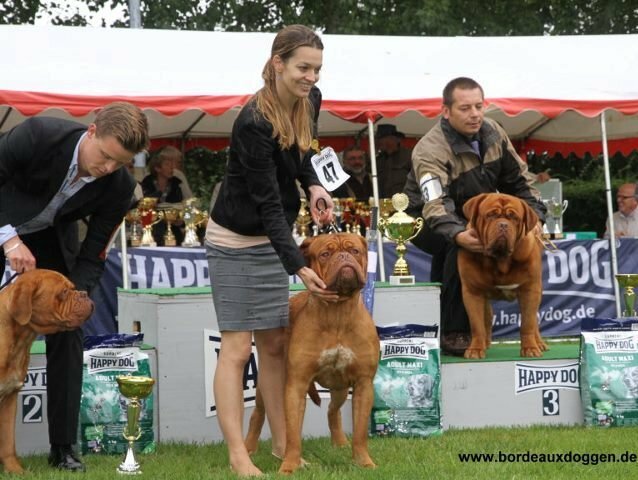 And Matrix who got several champion titles in the US and Roumba in Finland. 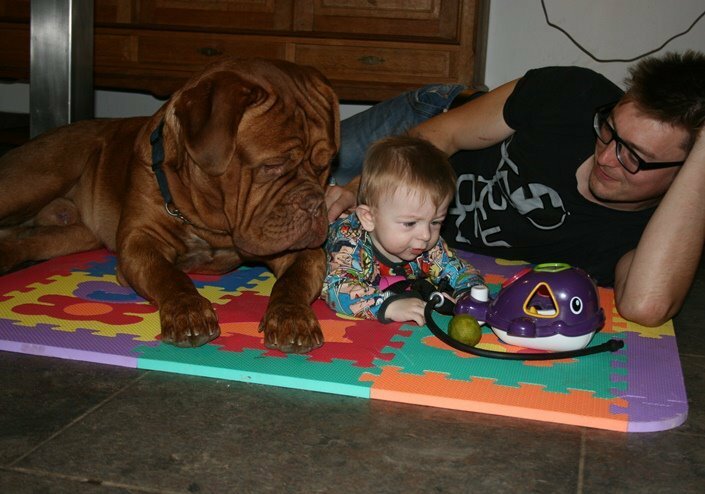 Mambo - 2nd best male puppy - 6 months old. See more pictures from the show here. All the puppies have now left for their new homes and since Nyx only had 3 puppies and it wasn't exactly hard on her we have decided to breed her again in her next heat. See more about her next litter here. Rio will be in heat soon and because we liked Nyx' litter so much we have decided to breed her to Mambo. Also we hope to keep a female for ourselves from this breeding. We haven't had time to show at all for ages, but we have decided to go to the French Clubmatch this year. 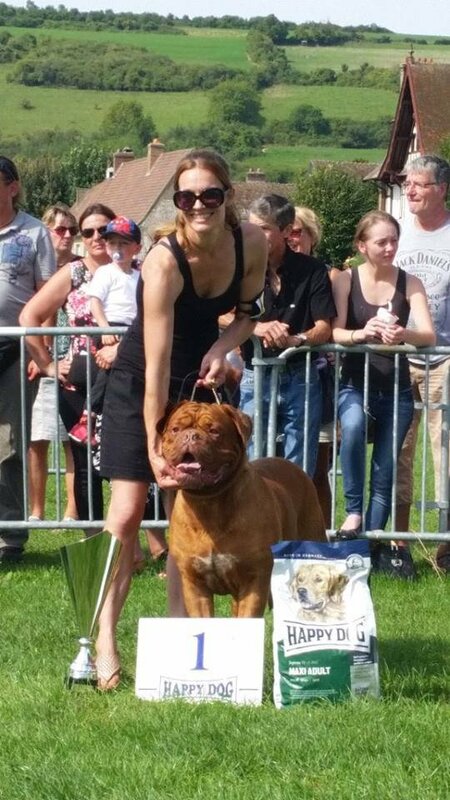 We are showing Mambo in the champion class and Pondus in Intermediate male. Exciting :-)! 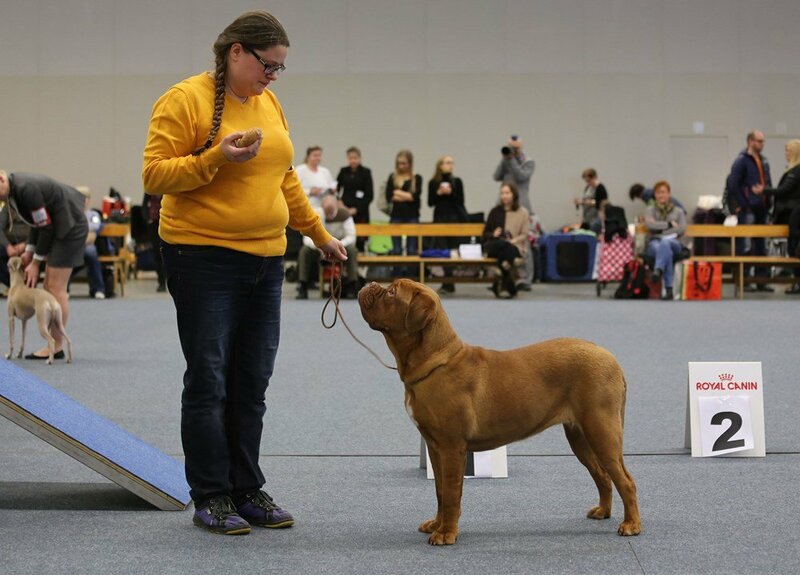 Amazonite Roumba (aka Seita) continue to rock showwise and is now Estonias Junior Champion (became BOB two days in a row). Hard to believe that the first puppy is leaving in less than a week! They are just the sweetest little bunch and we are going to enjoy every second with them. New pictures in the gallery - see it here. Colombo is moving to Copenhagen and Marco Polo is moving to Germany (when he can due to the new rabia rules). Time is passing by way too fast and in just 2 weeks our babies are moving to their new homes! These days we are also doing a lot of house renovating and it pretty much takes up all our time. For that reason we don't have time to show at the moment, but hopefully we will be back in the showring later this year. 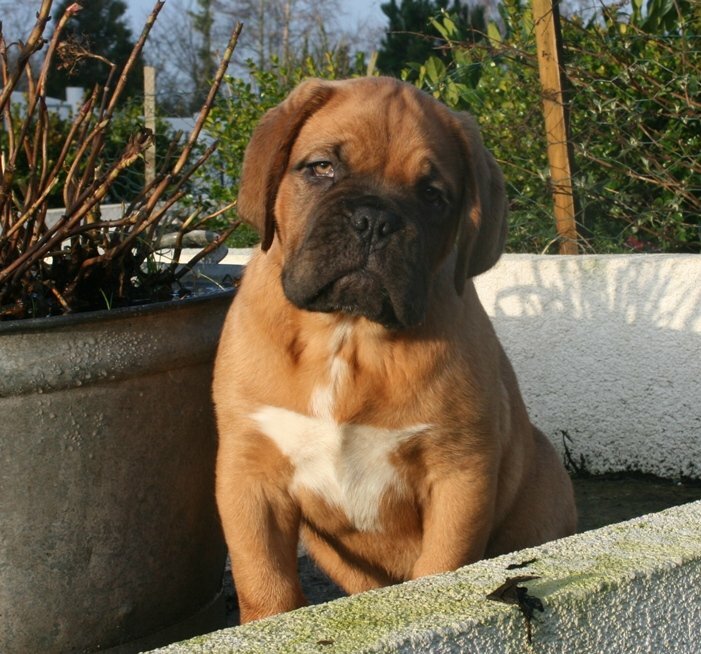 Since we are no-shows it is great that some of "our" puppies are shown by other people. 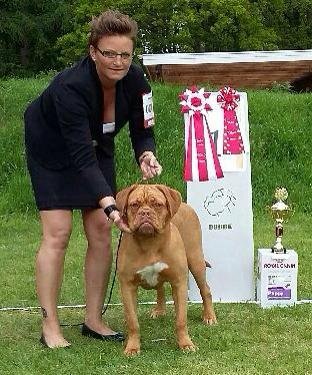 Amazonite Roumba (Finland) is doing great and just got her first title "Estonian Junior Winner". 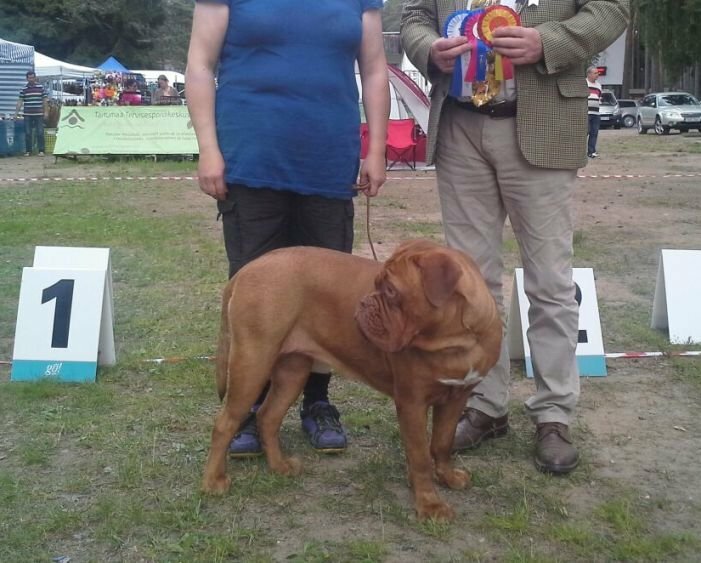 Also Mambos daughter from Kennel Shadow of Oak did well at the Danish Club show and became best puppy. See pics below. Amazonite Mucho Mambos daughter "Judy" - she looks a lot like J'adore! Pondus & Storm - best friends! 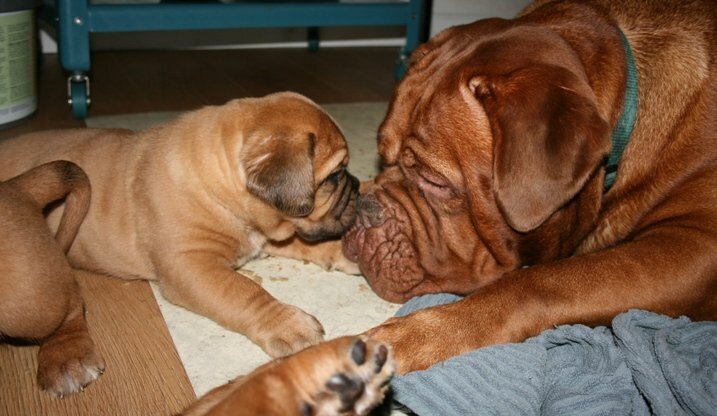 It has been too long, I know... Time is just flying and the pups are almost a month! 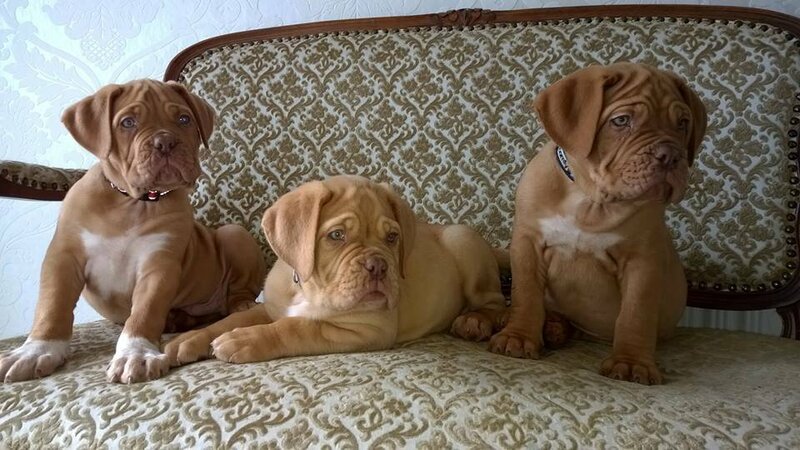 They are all doing great and have grown well into fat little monsters :-) Soooooo cute!!! Nyx are no longer interested in staying in the puppy room for too long, so we let the other dogues come in from time to time. Rio loves them and helps taking care of them. I have made a gallery for them - see it here. 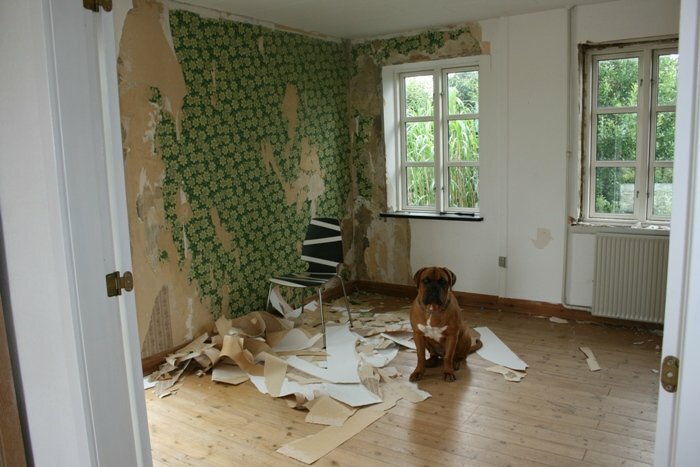 We are renovating hous BIG TIME and for that reason we are no-show at the shows for the moment. I do hope to show Rio and Pondus in the Fall though. Nyx' puppies are finally here! As I expected it was a small litter; 3 beautiful boys with an attitude. She popped the first one in one of the doggie beds just as I came back from kindergarten with 2 kids. It was so lucky that I came home that second because the puppy was still covered and Nyx was anxious because of the other dogues and didn't really know what to do. I got the rest of the gang shuffled away, got the puppy cleaned up andgot Nyx and the baby into the puppy room. Soon after the second puppy followed and an hour later puppy number 3 arrived. The whole thing went smoothly and was over in less than 90 minutes. Everybody's doing great! Very soon now... Nyx' puppies should be here very soon!! She sleeps most of the time now, so I'm sure she is looking forward to getting them out. It has been a while again.... In beteween starting a new job, kids, the flu and what not times has just flown by. I updated Pondus' gallery - see it here! I hardly ever get any good pictures of "Mr-Impossible-to-photograph" as he RUNS towards you when he sees you with a camera. He is a year oold now and is turning into a beautiful boy. I'm looking forward to shwing him later this year. Dad : Amazonite Mucho Mambo HD: A, ED: 0, Multi Champion. Life with dogs is sometimes up and down... Within a week we two sad e-mails that Vega and Calypso (once owned by us and later rehomed as they didn't get along) had passed away. Vega had just turned 9 years old and had up until a few weeks before been happy and healthy. 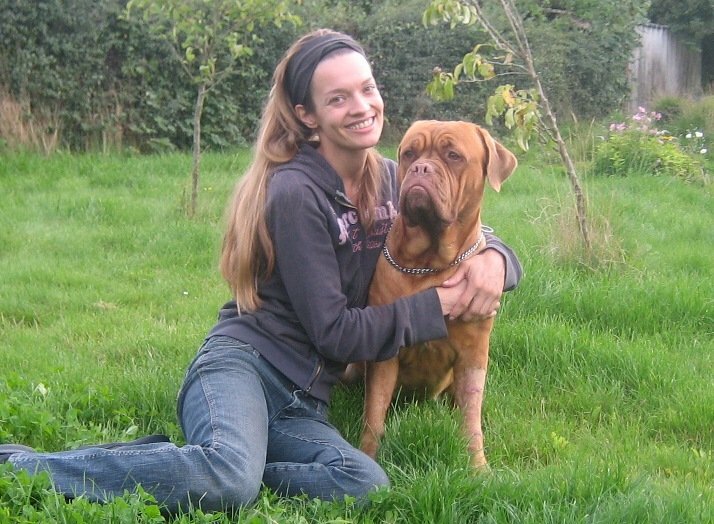 Calypso was a few months past her 8th birthday, so basically both had reached a very good age for a Dogue de Bordeaux. 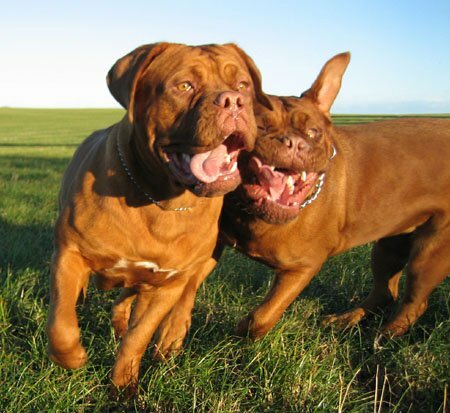 Since they were both in our very first Dogue de Bordeaux pack they were both special to us. 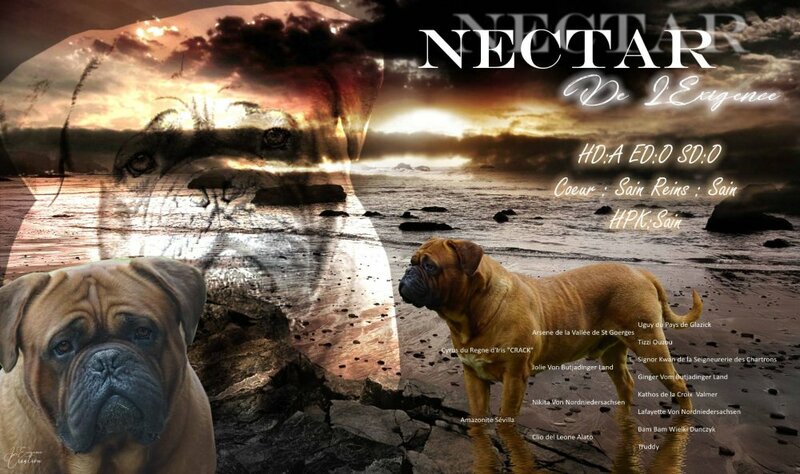 Vega was our very first Dogue de Bordeaux. 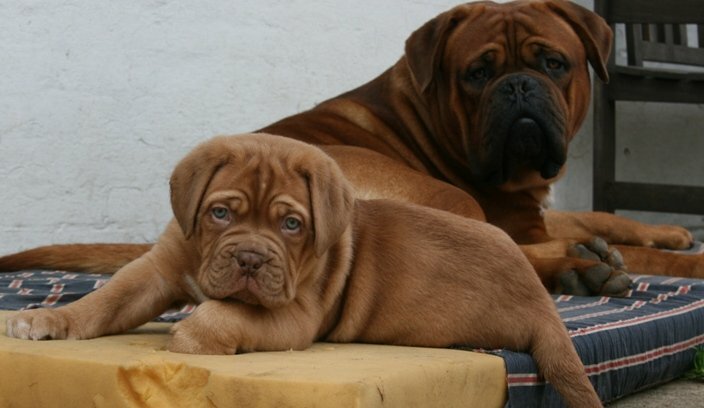 We plan to breed them both this year, so keep an eye on our "Puppy" section for more information. We will use Mambo on Nyx and haven't figured out who to use on Rio yet. 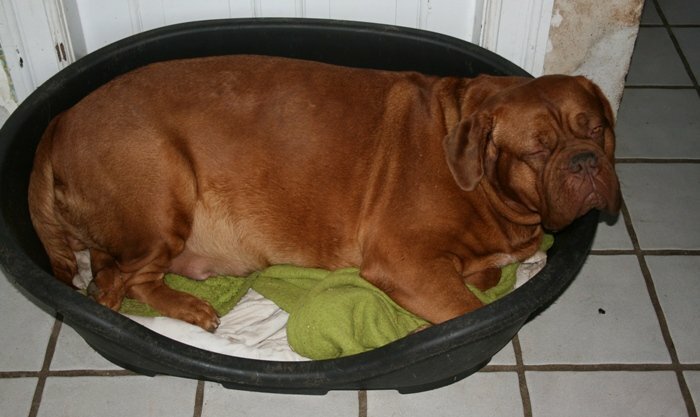 Mambo will be a father again soon in another kennel here in Denmark - at this point they haven't arrived yet, but we will post pictures as soon as they do. On a more sad note we lost Matrix this year :-( He was owned by Kris Munday and lived in the States, but as he was just so special we had him for a long time as a puppy and continued to follow him closely in his new home. 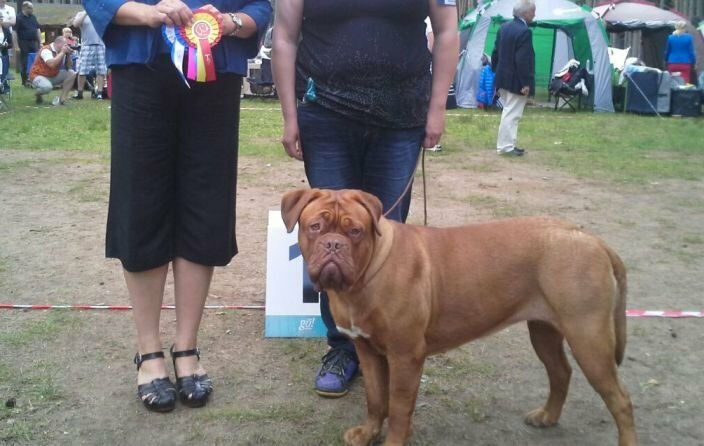 He was amazing in the show ring and won a lot and we were of course very proud of him. It's sad that he left us at such a young age, but the memory of him lives on in his beautiful offspring. 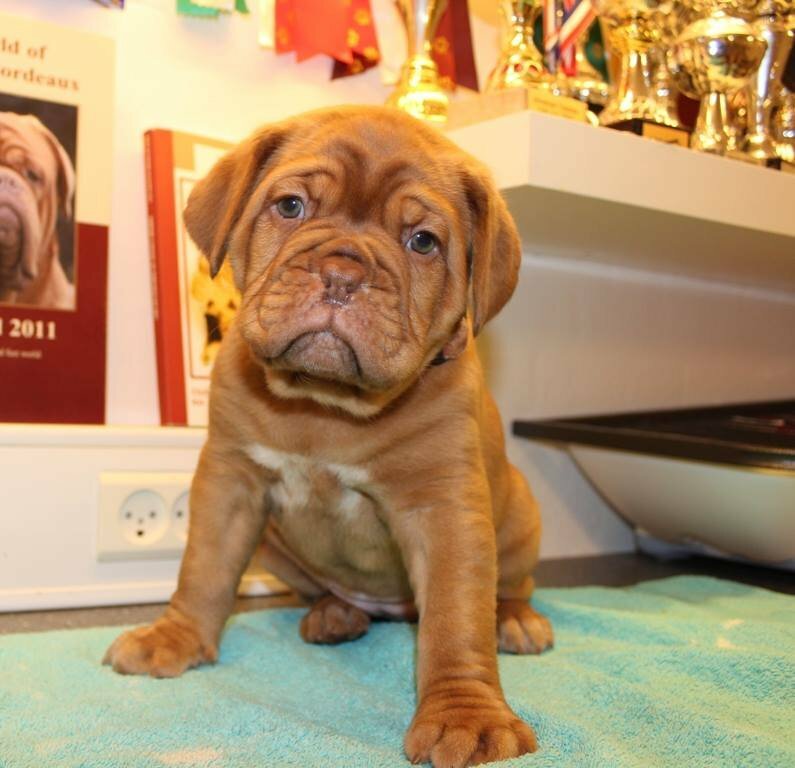 Amazonite Roumba (aka Seita) has started her show carreer really well in Finland by become BOB puppy 2 days in a row with excellent critiques. Otherwise we are looking forward to what this year will bring. As we ourselves (for a change!) has no baby plans of our own this year we will probably go to more shows and show Rio and Pondus, our two black pearls.